This much-vaunted Dublin five-piece follow a series of increasingly successful 7-inch releases and acclaimed support slots with the likes of Shame and IDLES, with Dogrel, named for the "lowest" form of working class Irish poetry, and a debut to die for. 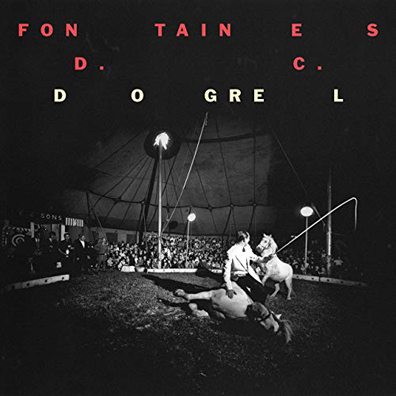 Attempting to evade hyperbole here, inevitably failing, Fontaines D.C.'s first album is a record that stands shoulder to shoulder with some classic self-titled debuts—The Smiths in '84, Suede's opening shot in '93, or perhaps, if you're willing, that decent Stone Roses one from '89. Bear with us. It's that good. Bursting into life with "Big" and its crazily ambitious, entirely achievable chorus ("My childhood was small/But I'm gonna be big") this is a one and a half minute explosion of everything that can be great about guitar music—bags of attitude, lashings of lyricism ("Dublin in the rain is mine/A pregnant city with a Catholic mind"), a furious, insistent, addictive chorus, a singer in Grian Chatten whose delivery feels instantly iconic—the loping vowels of his accent ringing clear and true with every utterance. The clear comparisons to artists from the '80s and '90s are unavoidable here—on "Sha Sha Sha," a rock 'n' roll tune warped out of shape with surrealist imagery and driving repetition combined with sly shifts and musical maneuvers, you can hear The Fall; in the unbridled minor key heartache of "Roy's Tune" you can practically hear Morrissey and Marr scratching away in a dank Manchester bedroom. Yet on every song, with every evocation of a legend, they offer something entirely fresh; a new twist on an old form. They sing often of the ever-changing Dublin—a city that courses through the translucent veins of every tune here; "The Lotts," a sad, Cure-like number, atmospheric and angst-filled, taking its title from a local bar; "Liberty Belle," an irresistible retro rocker that saunters and struts as confidently as anything tossed out by the early 2000s NYC scene, again named for an historic neighborhood watering hole, opening with the glorious, casual line "You know I love that violence that you get around here, that kind of ready, steady violence." On "Television Screens" (which shares its title with the first ever Irish punk single) we're treated to a sublime bass line from Conor Deegan III which lifts a stunningly evocative post-punk tune to the heavens, sending genuine chills down the spine. It's not possible to express too vehemently just how perfectly this band capture modern mournfulness through a filter of classic, yet reimagined, rock tropes. What's perhaps most remarkable about this debut is the assurance with which it's delivered-they make it seem so damn easy. Tossing out dead-cert floor-fillers like "Too Real" with aplomb, and filling it with lines like "None can revolution lead with selfish needs aside" suddenly sounds like the most natural thing in the world; the raucous ramrod of "Chequeless Reckless" rocks like crack yet plays home to precocious, brilliant lines like "Charisma is exquisite manipulation/And money is the sandpit of the soul." It's unsurprising that the band members first met at a poetry class. Evoking Joyce and, yes, of course, Shane Macgowan, closing song "Dublin City Sky" is a built-in, encore-closing, arena-filling sing-along in the finest off-kilter folk tradition. Impossibly poetic lines like "She threw her shoes into a bag and danced just like a dream/Her face was rubied up like no sun I'd ever seen" and "The January markets filled the cold air with the sound/The boys all full of laughter and their pocket with the pound/And in the foggy dew I saw you throwing shapes around" flow like wine, and your cup will indeed runneth over.